Beginning today, drivers across the country will have their first opportunity to order their Nissan LEAF, as Nissan North America expands availability for all U.S. markets, nationwide. 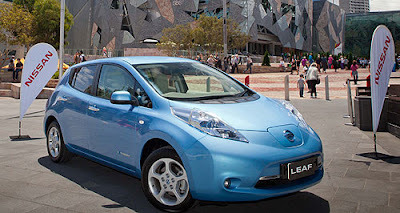 This new launch phase means residents of 21 new states will be able to select and order a 2012 Nissan LEAF. The LEAF is the only electric car ever to be available nationwide. "More than 22,000 LEAFs are on the roads globally, having driven more than 30 million miles," said Brian Carolin, senior vice president, Sales & Marketing, NNA. "There is no longer any doubt that a 100-percent electric, zero-emissions vehicle fulfills the needs and desires of drivers from around the globe. Nationwide availability of the Nissan LEAF means that now, anyone in the country can opt for a transportation solution that does not harm the environment, provides a pathway to energy independence, and doesn't use a single drop of gas." On March 1, reservation holders in the remaining 21 states will receive emails from Nissan inviting them to engage in the Nissan LEAF ordering process. One week later, anyone living in these new markets will have the opportunity to place a reservation and order a Nissan LEAF. Deliveries will start taking place in these new markets by summer.